I would like to think that the nuclear deal with Iran is a good one. I would like to think that it will succeed and prevent Iran from ever becoming a nuclear power. I would like to think that it will increase regional stability and security, and that in doing so, it will increase global stability and security. I would like to think that those who staff the Obama administration–from the president on down–will be able to point to the agreement decades from now and say “we did good. We made the world safer. We have every reason to be proud.” And I would like to think that Americans and people across the world will have every reason and every justification to agree with such a statement. But as of this writing, I have my doubts that this is a good deal. Let’s start with the concession that no deal with Iran will be perfect. Let’s also start with the concession that there is absolutely no will whatsoever for military action in order to dismantle Iran’s nuclear program. In order to dismantle the program, Iran would have to be invaded and occupied, the current government would have to be displaced and overthrown by force, and the United States would have to settle in and fight the inevitable insurgency. We have seen this movie before, and whatever you think about the invasion and occupation of Iraq, Americans ended up not liking it. But having stated all of these concessions, none of us are obliged to check our critical thinking skills at the door. We can examine the deal, we can figure out what its good and bad points are, and we can decide whether the deal, on balance, is a good or a bad one. Here is the text of the deal. I cannot claim that I read it with the loving and lingering care that would be employed in reading Gibbon’s history of the decline and fall of the Roman empire, but I read through it. And I have concerns. Let me list them. Russian designed, fabricated and licensed fuel assemblies for use in Russian-supplied reactors in Iran do not count against the 300 kg UF6 stockpile limit. Enriched uranium in fabricated fuel assemblies from other sources outside of Iran for use in Iran’s nuclear research and power reactors, including those which will be fabricated outside of Iran for the initial fuel load of the modernised Arak research reactor, which are certified by the fuel supplier and the appropriate Iranian authority to meet international standards, will not count against the 300 kg UF6 stockpile limit. The Joint Commission will establish a Technical Working Group with the goal of enabling fuel to be fabricated in Iran while adhering to the agreed stockpile parameters (300 kg of up to 3.67 % enriched UF6 or the equivalent in different chemical forms). This Technical Working Group will also, within one year, work to develop objective technical criteria for assessing whether fabricated fuel and its intermediate products can be readily converted to UF6. Enriched uranium in fabricated fuel assemblies and its intermediate products manufactured in Iran and certified to meet international standards, including those for the modernised Arak research reactor, will not count against the 300 kg UF6 stockpile limit provided the Technical Working Group of the Joint Commission approves that such fuel assemblies and their intermediate products cannot be readily reconverted into UF6. This could for instance be achieved through impurities (e.g. burnable poisons or otherwise) contained in fuels or through the fuel being in a chemical form such that direct conversion back to UF6 would be technically difficult without dissolution and purification. The objective technical criteria will guide the approval process of the Technical Working Group. The IAEA will monitor the fuel fabrication process for any fuel produced in Iran to verify that the fuel and intermediate products comport with the fuel fabrication process that was approved by the Technical Working Group. The Joint Commission will also support assistance to Iran including through IAEA technical cooperation as appropriate, in meeting international qualification standards for nuclear fuel produced by Iran. Vladimir Putin appears to have an awful lot of power with which to influence the course of this agreement. Anyone really believe that he will exercise that power in a fashion that will please the United States, or will advance American national security interests? Notice the word “intends.” This language does not impose any particular obligations on Iran. One can easily imagine a series of disputes that cause the United States and the European Union to re-impose sanctions on Iran, thus causing Iran to decide that it is no longer bound by the terms of the nuclear agreement with the United States and the European Union. In the run-up to the agreement, we were assured that in the event of any Iranian violations of the terms of an agreement, the United States and the European Union would be able to reimpose snapback sanctions. The excerpted language from C26 restricts those sanctions from being reimposed, because both the United States and the European Union would have to fear that Iran will commence in earnest a program to acquire nuclear weapons capability. For 15 years Iran will not, and does not intend to thereafter, engage in any spent fuel reprocessing or spent fuel reprocessing R&D activities. For the purpose of this annex, spent fuel includes all types of irradiated fuel. For 15 years Iran will not, and does not intend to thereafter, reprocess spent fuel except for irradiated enriched uranium targets for production of radio-isotopes for medical and peaceful industrial purposes. For 15 years Iran will not, and does not intend to thereafter, develop, acquire or build facilities capable of separation of plutonium, uranium or neptunium from spent fuel or from fertile targets, other than for production of radio-isotopes for medical and peaceful industrial purposes. There is that word “intend,” again. Intentions are not obligations. Iran will increase the number of designated IAEA inspectors to the range of 130-150 within 9 months from the date of the implementation of the JCPOA, and will generally allow the designation of inspectors from nations that have diplomatic relations with Iran, consistent with its laws and regulations. Notice that the inspectors have to come “from nations that have diplomatic relations with Iran.” Guess who doesn’t have diplomatic relations with Iran. That’s right; the United States. So American inspectors can apparently play no role in the inspections process. Are we supposed to feel good about this? Pages 55-56 of the agreement indicate that sanctions that are meant to limit Iran’s supply of ballistic missiles will remain in place. This is nice to know. However, there is nothing in the agreement that discusses the imposition of a hard ceiling on Iran’s supply of ballistic missiles. I have long stated that one of the shortcomings of the nuclear negotiations with Iran was a lack of focus on preventing Iran from acquiring a large stockpile of ballistic missiles. While it is good that sanctions will remain in place that are intended to keep Iran from dramatically increasing its ballistic missile stockpile, it is more than a little distressing that there are no provisions in the agreement that will place certain and strict limits on Iran’s supply of ballistic missiles. Finally, there is the fact that the word “inspection” only occurs three times in the text of the agreement, and none of those instances discusses snap or surprise inspections that can verify that Iran is not cheating on its obligations under the agreement. Team Obama appears to be confused as to whether it has ever demanded that snap inspections should be able to take place “anywhere, anytime.” Again, no one should be comforted. Indeed, the design of the inspection regime is a fundamental failing of the agreement, and reveals an unforgivable lack of attention given to the terms of the agreement by Team Obama. 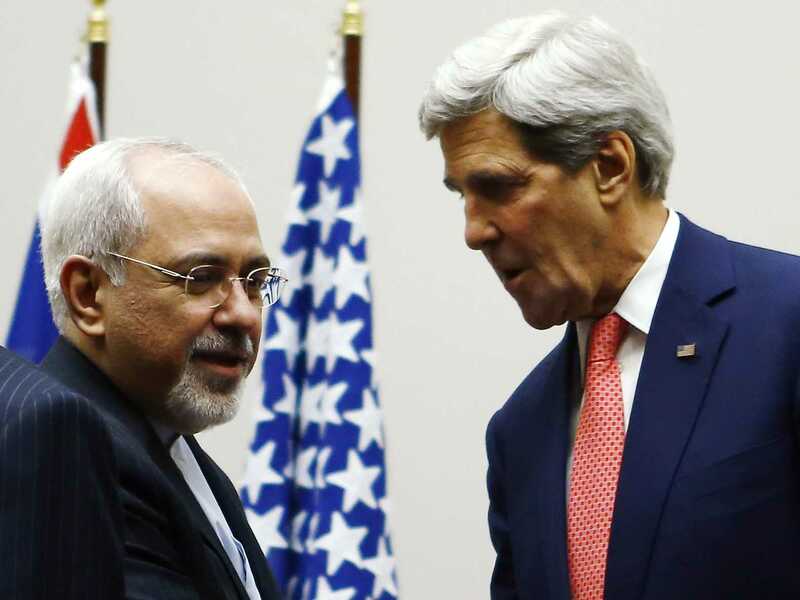 Mixing shrewd diplomacy with open defiance of U.N. resolutions, Iran has gradually turned the negotiation on its head. Iran’s centrifuges have multiplied from about 100 at the beginning of the negotiation to almost 20,000 today. The threat of war now constrains the West more than Iran. While Iran treated the mere fact of its willingness to negotiate as a concession, the West has felt compelled to break every deadlock with a new proposal. In the process, the Iranian program has reached a point officially described as being within two to three months of building a nuclear weapon. Under the proposed agreement, for 10 years Iran will never be further than one year from a nuclear weapon and, after a decade, will be significantly closer. “Soleimani is the guy that sent the copper-tipped IEDs into Iraq,” said Senate Armed Services Committee Chairman John McCain, referring to powerful improvised explosive devices, which Marine Corps Commandant Gen. Joseph Dunford testified last week were responsible for the deaths of 500 soldiers and Marines. “That is really unbelievable,” McCain said when asked about Soleimani’s name showing up in the bowels of the Iran nuclear deal. I’d really like to think that the nuclear deal that has been struck with Iran is a good one. But I have lots of reasons to think that it isn’t. Well, I hadn’t read the text of the agreement (despite many telling me what to think). Now that you have for me (and cogently analyzed it), I’m even more inclined to be against it. But, given our unwillingness to do an air strike, even our allies can undermine the present sanctions. Ugh.